Among the amazing inventions that Time Magazine selected for its Best Inventions of 2008, is a package designed to keep food growing while it travels from field to table -- over the meadow and through the woods! 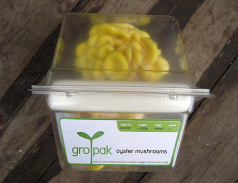 The package, called the Gropak, is a conceptual design by Netherlands-based Canadian Agata Jaworska, who got her inspiration from a Boston lettuce that still had its roots and some soil sticking to them. Jaworska imagined that the fresh tasting lettuce really did come from Boston! More than likely it didn't, but Jaworska believes that it could if it was picked before fully grown and could keep growing from Boston to, let's say, Amsterdam. Now don't get excited, footprint watchers, Boston to Amsterdam is not Jaworska's goal. But for locally grown produce, Made in Transit should work very well. Her system, of course, goes beyond just the packaging to an entire delivery concept Jaworska calls Made In Transit, and she created this short video to show how it goes down. It would be great to see Jaworksk's concept come to fruition. 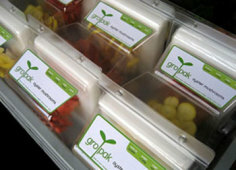 Perhaps now that her Gropak and Made In Transit concepts have been recognized in Time's Best Inventions of 2008, she might get some funding to further her project. Hopefully, in the near future, our date stamps will read: eat after Nov 6, instead of eat by Nov. 6. Beetle Larva Candy... Now That's Good Grub!